On February 22nd, the United States Institute of Peace’s Director of Africa Programs Susan Stigant and former Deputy Assistant Secretary of Defense for African Affairs Amanda Dory discussed the recent terror threats in Sub-Saharan Africa as a part of the USIP-PSA congressional briefing series. 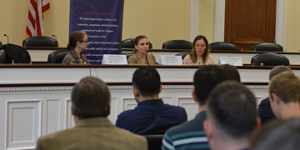 Congressional Research Service Specialist in African Affairs, Lauren Ploch Blanchard, moderated the discussion. 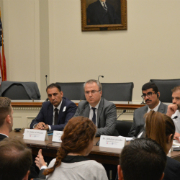 The briefing explored the role for U.S. military, regional partners and civil society in countering these threats. In addition, the briefing focused on the evolving footprint of the U.S.’s military presence in the region and what regional partners and civil society can do to build a sustainable stability. This event was a closed off-the-record event held for congressional staff. Susan Stigant is the director of Africa Programs at the United States Institute of Peace (USIP) where she oversees programming in South Sudan, Nigeria, Sudan, CAR, DRC, Tanzania and Kenya and with the African Union. Susan’s thematic focus is on the design and implementation of inclusive constitutional reform and national dialogue processes. She has and continues to advise government officials and civil society actors on inclusive processes in Sudan, South Sudan, Libya, Somalia and elsewhere. Susan also serves as co-chair of USIP’s national dialogue working group. Prior to joining USIP, she managed constitutional development, citizen engagement and election observation programs with the National Democratic Institute (NDI). From 2005-2011, she served as program director with NDI in South Sudan, where she supported the implementation of the peace agreement. She also worked with the Forum of Federations on comparative federalism and with the research unit of the Western Cape Provincial Parliament in South Africa. Amanda J. Dory joined the War College faculty in 2017. She is a career member of the Senior Executive Service. From 2012-2017 she served as the Deputy Assistant Secretary of Defense for African Affairs in the Office of the Secretary of Defense (OSD). She served as the Deputy Assistant Secretary of Defense for Strategy from 2008-2011 and as the Principal Director for Policy Planning in OSD. In both capacities her responsibilities included strategy development, force planning scenarios, and long-term trends analysis. She has worked on multiple Quadrennial Defense Reviews (QDRs), to include as the chief of staff to lead implementation of QDR execution roadmaps for Building Partner Capacity and Irregular Warfare in 2007-2008. In addition to strategic and regional assignments, Amanda has also served in OSD’s Homeland Defense office as the director for planning and integration. In 2002, she was selected as a Council on Foreign Relations International Affairs Fellow and conducted an independent research project based at the Center for Strategic and International Studies. Amanda has received numerous awards to include the Presidential Rank Award in 2010 and 2015 and awards for exceptional and meritorious civilian service. She is an alumna of Georgetown University’s School of Foreign Service and received a master’s degree with concentrations in international economics and African studies from the Johns Hopkins School of Advanced International Studies. She is a member of the Council on Foreign Relations. Lauren Ploch Blanchard is a Specialist in African Affairs with the Congressional Research Service (CRS), where she provides nonpartisan analysis on African political, military and diplomatic affairs, and on U.S. policy in the region, to Members of Congress, congressional committees, and congressional staff. Her portfolio focuses on East Africa, Nigeria, and Chad, and on security issues and U.S. military engagement on the continent—she has written extensively on these topics and has testified before Congress on terrorist threats in the region, security assistance, and the U.S. military’s Africa Command. Ms. Blanchard speaks regularly at academic and official institutions such as the National Defense University, the NATO Defense College, and the Foreign Service Institute, and at international policy forums. She has served on international election observation missions in several African countries and has conducted training for African parliamentarians and other government officials on the policymaking role of the United States Congress and on the role of parliamentary research institutions like CRS. Prior to joining CRS, she managed governance programs in East and Southern Africa. During that time, she supervised and conducted training on political party and coalition strengthening, parliamentary support, civil society capacity building, and public opinion research. She also consulted on constitutional reform efforts in Kenya and the development of democratic institutions in Southern Sudan. Previously, Ms. Blanchard served as Legislative Assistant in the United States Senate. Lauren holds a master’s degree in National Security Studies from Georgetown University. She also holds a bachelor’s degree in Political Science and Classical Studies, with a minor in African Studies, from the University of Florida.